Lovely Exquisite Colonial Home w/Additional Guest House. Ideal Central Location! 2 bedroom Main House and 1 bedroom/ 1 bath Guest house! CASA LUCIA - A Simple Colonial Beauty. As you enter through the heavy antique wood doors of Casa Lucia you immediately feel the wonder and magic that this family home and very charming one room casita have to offer. You will find yourself immersed in the ambiance of colonial times but with all the modern conveniences of home. HISTORY - We are celebrating the newly released RIZZOLI coffee table book 'Casa San Miguel, Inspired Design and Decoration' by Annie Kelly. Several spectacular Colonial homes showcased in this book are directly mirrored in the architectural detailing and design of our own renovated Colonial home, Casa Lucia. In collaboration with a group of master craftsmen and artisans, this beautiful property was lovingly restored offering a wonderful blend of old world character and ambiance of colonial times, with modern day luxury and all the comforts of home. ARCHITECTURE - Casa Lucia, where inside of sheltering stone walls you will find hidden a world of private beauty and relaxed seclusion; an elegantly refined Colonial, a simple architectural gem with charming indoor spaces and gracious outdoor living areas. From the moment you pass through the wooden antique doors into the entry hall, you realize you have entered a uniquely special sanctuary. You find yourself looking through a large stone archway, down a paved walkway lined with luscious plants and vine covered walls. Four large sets of glass French doors to your right usher you in to the living room, dining room, and kitchen respectively. These doors bask the interior of the main house with light, enhancing the smallest details of the meticulously restored rooms including large stone fireplaces, hacienda furniture adorned with brightly colored pillows brought in from San Cristóbal de las Casas, antique Persian rugs, thick walls, high ceilings with beautiful old mesquite beams and lovely chandeliers throughout. Throw open all the glass doors creating a flow of indoor-outdoor living. 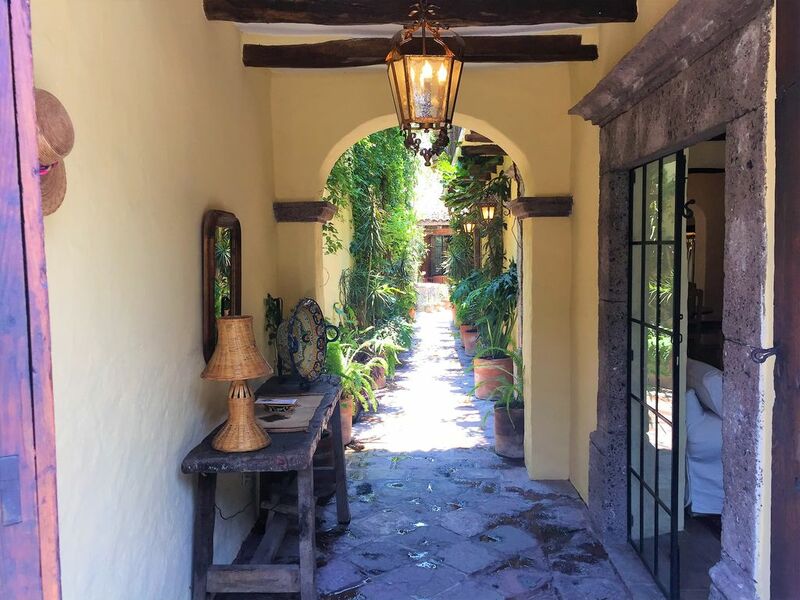 The paved walkway leads to the center courtyard filled with colorful flowers and plants, outdoor seating, a bubbling old stone fountain, the outdoor sala and charming little Casita. Both the Main House and the Casita open onto the center courtyard. All these elements come together to compliment the exquisite simple beauty of Casa Lucia. Our Guests are delighted by the pleasing atmosphere and the perfect, very convenient center location that this outstanding property offers. WI_FI - Casa Lucia offers modern convenience with high-speed Internet/Wi-Fi, DVD, Basic Cable, Safe Boxes for your valuables. KITCHEN - Gourmet kitchen boasts a 6 burner professional chef stove with a huge campana (hood) that reaches to the ceiling. Up to date modern stainless steel appliances. Lovely green cemento pulido (smooth, hand tinted finished cement) counters with deep double sinks. Large center island is great for preparing meals, informal eating, gatherings and entertaining. The island has stools for people who like to watch the cook. Kitchen is spacious and open to the dining room and courtyard. Truly an inspirational room for many wonderful meals. DINING ROOM and LIVING ROOM - These striking rooms with open floor plans and large archways deliver the vision of elegant, classic and timeless Colonial style. The two rooms center on comfortable hacienda furniture and both rooms feature large stone fireplaces, unique chandeliers, antique Persian rugs, high 12' ceilings with mesquite beams, thick walls and several glass french doors. OUTDOOR LIVING ROOM - Since San Miguel's weather is nearly perfect year round, you will spend most of your time here, in the beautifully hand-crafted, covered Outdoor Sala; You will enjoy hacienda mesquite furniture decorated with brightly colored pillows, beautiful old columns holding up the red clay tile roof, stone walls, exposed wooden beams. BEDROOMS - Two bedroom suites (sleep 4) are located up a comfortable, graceful stone stairway rising from the courtyard. Separate outdoor entrances to the bedrooms increase privacy and give the rooms a feel of intimacy. Bedroom suites with hand-wrought decorative queen size iron beds, fine linens, new pillow-top mattresses, ample closet space, cozy chairs, private safe boxes, gas stone fireplaces for ambiance and to help cut the chill, exposed wooden beams, old mesquite french doors and screen louvers that can be opened or closed to the terrace as you desire. The master bedroom is graced with its own sun-filled terrace and bamboo shade roof with comfortable chaise and chairs. BATHROOMS - Each bedroom affords the luxury of its own private en suite bathroom. Bathrooms are completely restored by local artisans, the traditional cemento pulido as the finish of choice for the hand-shaped sinks, counters and walls. An archway separates the cemento pulido tub and shower area for more privacy. Also on the ground floor, under the elegant stone steps there exists another unique, Moroccan style, beautiful hand-shaped 'guest' bathroom that glows in burnt-orange cemento pulido detail, charming Moroccan hand-shaped sink, crystal sconces. GUEST HOUSE - Large Family Room or converts to Bed Room that Sleeps 2 (2 daybed sofas convert to single beds, or one king bed). Made available to our Guests for their pleasure to enjoy by the owners. Access to this space secures complete Privacy within the property walls. Guest House echoes the Main House in very charming Colonial design and style. It consists of a family room, kitchen and full bathroom. Family room features 14' ceilings with mesquite beams, massive stone fireplace, cemento pulido floors. Glass doors open to the Outdoor Sala and Courtyard. Guest House is available to our guests, and dramatically extends the living area. Guest House can be converted to a third bedroom upon request, or used as a work space, artist's get-away (a professional Dulce Easel available). Guest House can be used for entertaining, watching TV, reading and relaxation. Two daybed sofas, a beautiful old mesquite work table, large coffee table, TV/DVD. Fully equipped, very charming little cemento pulido Kitchen mirroring the Main Kitchen in design but smaller. Full Bathroom with tub and shower. A unique sink, made of an old round stone trough. Washer/Dryer. Two single daybeds can be converted into one king size bed in the Family Room. Please request ahead of time, two single beds or one king bed. WATER - All water in both houses is safe and drinkable. Casa Lucia has a full house Water Purification System, Pressurized Water System, On-Demand Water Heating. LOCATION - Casa Lucia is situated in a treasured Central location (1 block from the famous, old Instituto de Allende, a cultural icon) from which you can walk and explore all of San Miguel. You experience the flavor of living in an authentic Mexican neighborhood filled with the sights and sounds of everyday life, or walk half block and you are on the bustling main avenue, Ancha de San Antonio, a main artery of San Miguel. Slip right into the excitement of San Miguel! If you make a left on Ancha you walk past shopping and galleries and restaurants, cafes and markets. You end up in our main town square called the Jardin, about a 15 minute easy walk. Or you can explore all the little winding cobblestone streets and alley ways off of Ancha to get to the Jardin, our main town square. When you are there, check out the Parroquia, the most famous church and landmark located on the square. You can sit on the park benches for hours and observe, or read the local paper, enjoy our street food carts on the plaza, chat with people, find out all the local goings on... or wander further and explore for days. As mentioned earlier, Casa Lucia is one block from the famous Instituto Allende where art, spanish, jewelry classes, etc. are available. You can shop the fabulous outdoor Organic Market on the Instituto de Allende grounds that offers so many different fresh local herbs, fruits, breads, cheeses and vegetables. The house is so close that you can easily zip back home to deposit what you bought and go out again. Oh, and at the Instituto you can also enjoy freshly baked goods and local fare for lunch in the courtyard. If you leave the house and make a right on Ancha, you also discover blocks of cafes, markets, antiques, produce vendors, bakeries with fresh goods every morning, different restaurants and street food... Very close also is the most famous, beautiful PARQUE JUAREZ (the largest and most beautiful park in San Miguel). A couple of blocks away is the new famous 5 star Rosewood Grand Hotel with lovely bar, 360 of extraordinary vistas of San Miguel especially at sunset. CLAY TENNIS COURTS are available at the Weber Hacienda down the block From Casa Lucia. Taxis on Ancha run 24/7. This is something that you may not think is a big thing at the moment, but you will appreciate the ease of catching a taxi at moment's notice when you are heading out for the evening, or in a hurry to get somewhere! The taxis only costs $2 for trips around town. Have fun!! SERVICES - Jonathan Herrera, our Property Manager will meet and greet you when you arrive. Maid and Gardener services are provided. A bouquet of fresh flowers and copy of ATENCION, our town newspaper with local news/week's entertainment will await you upon arrival so you can immerse yourself immediately into the town events. Keywords: family home, colonial home, restored, traditional, unique, Guest House included, privacy, authentic architectural detail, perfect location, flat walk, central, WiFi, 5 fireplaces, clean, en suite bathrooms, spectacular, centro, walking distance, flat walk, close, neighborhood, outdoor living. toilet, Moroccan influence Guest Powder Room. Each bedroom has its' own En Suite Bathroom with tub and shower. Gas fireplaces in every room installed for ambiance. Six burner, stainless steel professional chef stove and toaster oven in big house. Small stove and toaster oven in Casita. Coffee Maker. Coffee grinder available. Small tv in each bedroom, and small tv in living room of main house. One larger tv in the casita great room. Bring you own DVDs. Or buy DVDs at the Tiangus on Tuesdays. Dvds can be rented at stores. And you can also catch your NETFLIX movies on your computer! Bicycle tours of San Miguel available in town. Center courtyard with outdoor seating and fountain. Outdoor living room/sala with sofa and chairs. Rooftop patio with umbrellas, chaise lounges and seating. Wonderful outdoor clay courts available across the street at Hacienda Weber. Guest House has a professional Dulce Easel for artists to use. Casa Lucia has a water softener as well as a water purification system. All water safe to drink. The only CLAY TENNIS COURTS in San Miguel available within steps from Casa Lucia at Walter Weber Hacienda. Steps away, The ROSEWOOD, the 5-star luxury hotel with spectacular views from their roof top restaurant for sunset drinks as written up in Conde Nast, NYT, Travel, etc! Casa Lucia surrounded by... Artisan/Organic Market 1 block away, cafes, restaurants, arboretum, Instituto Allende 1 block away with Spanish classes. Other spanish schools and art schools, dance classes, cooking classes, galleries, design center, near jardin. Great organic shopping right nearby. This house was the best! Beautiful interior with lots of outdoor/indoor space and very well appointed. San antonio neighborhood is terrific with lots of shops and restaurants and only a ten minute walk to center of town. We had a relaxing peaceful stay. Jonathan, the property manager, was very available and responsive. The house was as-pictured. We found the house loaded w/all sorts of groceries—how thoughtful! A little chilly inside the house (we’re from AZ) and the propane fireplaces couldn’t be used for more that 4 consecutive hours—and not while sleeping. Plus there’s a smell that is associated w/the propane. Took a carbon monoxide detector w/us but there was no real problem. The neighborhood itself can get noisy (car alarms, dogs barking) but such is life. The housemanager responded eagerly to every little text . Housekeeper (did not speak English) forced me to try harder and harder to listen and speak Spanish! The location (still quite walkable) was a teensy bit farther from the square than we usually stay, but the neighborhood was safe and friendly and there were well-stocked markets within a block or two in each direction including the Mercado Sano with its delicious, healthful foods. . (If I’d requested, I’m sure that the housemanager would have repaired the back upstairs door lock and replaced a small knob on the closet door). I did suffer an ankle injury while in SMA—and had wished for that reason we’d stayed closer to Rosewood area. Overall our guests loved the house and its colonial architecture/decor. A great vacation. We absolutely loved our stay in this beautiful home! Great neighborhood, close walk to Centro, quiet-yet just a few steps from a street full of restaurants & shops. Jonathan was lovely and attentive. We would definitely come back and stay again. Muchos gracias, Jonathan! Beautiful Authentic Mexican Home !! We spent five days in San Miguel for a wedding. We had a fabulous experience and a lovely stay at Casa Lucia! The home is decorated beautifully. The gardens, the decor was so authentic. The beds were comfortable and the kitchen is well equipped . Only a few minutes walk to Centro and lots of restaurants. We felt very safe walking both day and nighttime. The house manager met us there when we arrived from the airport and showed us the place. It was very clean. It is so magical and I will recommend this place to everyone . The property manager, Jonathan, helped us throughout. We had a car organized from the airport. Jonathan met us upon arrival and guided us through the house and answered all our questions. We would definitely use this place again. Such a beautiful house with lots of light and lovely outside areas with lots of flowers and plants. Jonathan was so kind by welcoming us as well as acvailable for any of our needs. The house is so beautiful and perfectly located in a small street but close to a Main Street. Very close to the rosewood hotel and instituto Allende. It has a big casita in the back with a full kitchen. San Miguel is once again on Conde Naste's 'Traveler Magazine' Top Ten Most Popular Cities of the World. A small colonial city and art center make it popular with cosmopolitan travelers... In addition, San Miguel has a beautiful year round climate, sunshine over 350 days a year, over 90 restaurants, art and language schools, and an educated population. In your spare time there's hiking, biking, golf, tennis, gyms, fishing, wildlife viewing, bird watching, horseback riding, shopping in antique stores, art galleries, crafts shops, live theater in English, cinemas, museums, sightseeing, swimming, concerts (classical, jazz, guitar, etc. ), bull fights and rodeos, fiestas, tours to nearby villages and spas and hot springs, Largest english book library in MX! $300 USD refundable security deposit required.